I could never be vegan. More power to those who have it in them, but life without cheese is not a life worth living. I don’t mean to be melodramatic, but if my LDL-cholesterol is going up, it will be in the name of cheese! When Rachel and Brandy invited me to participate in Mac and Cheese Mania, there was no decision to be made. 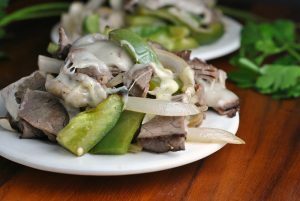 It was a recipe blog extravaganza made for me. Me and my cheese-loving soul. Be sure to link up YOUR favorite mac and cheese recipes for a chance to win prices (chosen randomly). Please note you do NOT need to be a blogger to participate…just head on over to Nutmeg Nanny or Rachel Cooks to enter! Prizes up for grabs include Door to Door Organics Gift Cards, OXO Gift Baskets, Zak Designs Prize Pack, a year’s supply of Cabot cheese, a Vermont Creamery gift basket, a risotto kit from Marx Foods, Barilla pasta, Anolon Advanced Bronze 4.5 Qt. Tapered Stockpot, Rachael Ray Stoneware Casseroval, Wusthof CLASSIC Studio Block Set, Microplane Graters and Kitchen Tools, a SavorX Starter Block with spices and Le Cordon Bleu by Swissmar oven to table roasters. All giveaways open to US residents over the age of 18 only. 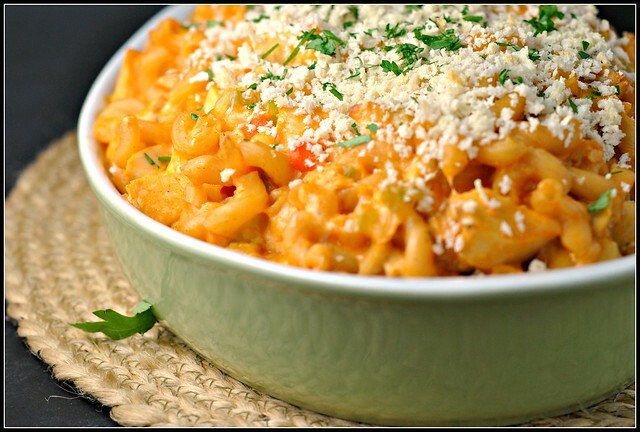 And what is Mac and Cheese Mania without tons of tempting mac & cheese recipes? 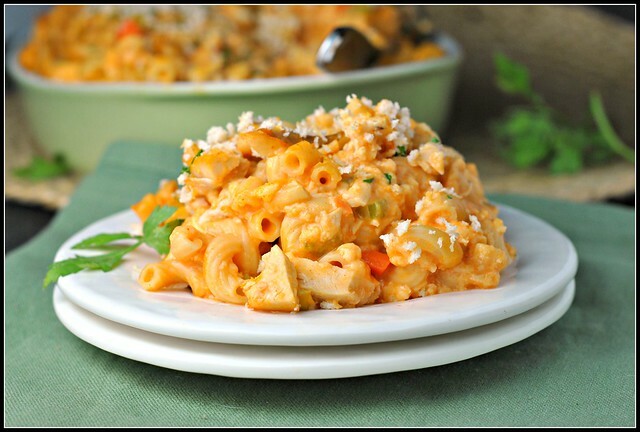 My contribution to Mac and Cheese Mania was this Lightened Up Buffalo Chicken Mac and Cheese…and it. was. faaaantastic. Preheat oven to 350 F. Spray a large baking dish with cooking spray and set aside. Bring a large pot of water to a boil; add the pasta and cook until al dente. Drain and keep warm. Meanwhile, melt butter in a large skillet over medium heat. Once hot, add the celery and carrots, cooking until soft, about 5 minutes. Add flour and stir to coat; cook 1-2 minutes. Add milk and half and half and bring to a simmer over medium heat. Once simmering, stir in wing sauce, dry mustard, and shredded cheeses. Mix until cheese melts; remove from heat and stir in the yogurt, mixing well. Mix in cooked pasta and shredded chicken. Transfer pasta to the baking dish and top with panko. Bake for 30-40 minutes or until bubbly. Serve hot, sprinkled with parsley. I really need to keep my eyes open for that Frank’s sauce here in the UK, it looks so tasty! Love this recipe! I am with you – a life without cheese is no life at all! 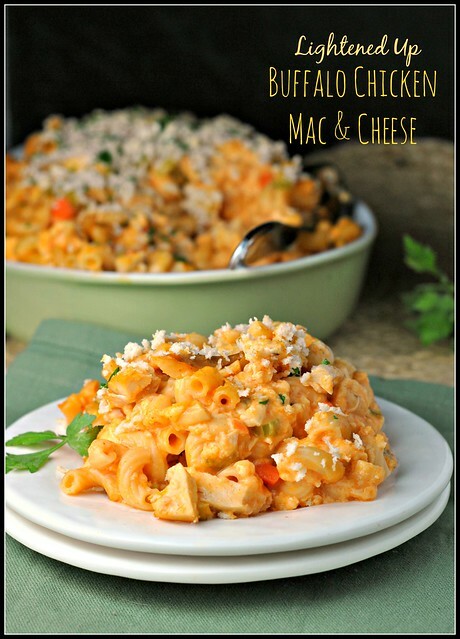 And I seriously love buffalo stuff, so this mac and cheese is going on my must make list. Pinned! Ohhhh yum! I love love love buffalo sauce! I definitely need to try adding it to some cheesy delicious Mac! Gahhh this is a dangerous post. Mac and cheese is my weakness!! I just love cheese, especially mac & cheese! This looks delicious! I am beyond excited to have found your page! I am a food blogger that concentrates on health and has PCOS as well. I am excited to look through you blog and find some delicious yet healthy recipes to try! Plus anything with buffalo has my name written all over it! 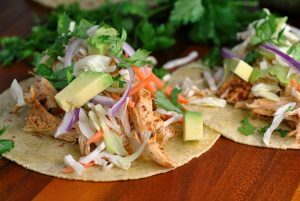 This is one of our favorite meals and I love that you lightened it up! This looks absolutely amazing! 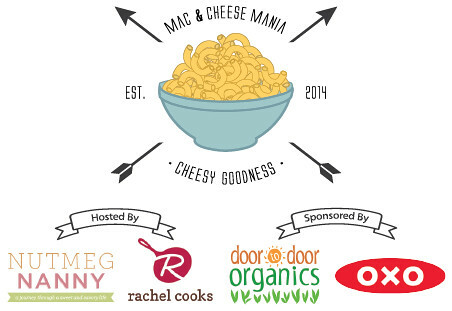 Thanks for contributing it to mac and cheese mania!!! Yum, love the spicy twist! Who doesn’t love buffalo chicken anything! 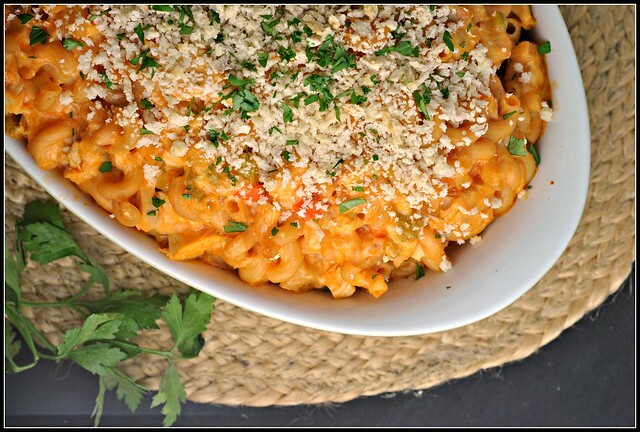 I love how we both went the buffalo mac and cheese route but in totally different ways! Looks good! I love buffalo chicken so I know this recipe would be a big hit at our house. OMG. We made this tonight and it was amazing. Fantastic (as usual, since it was coming from you)! : ) All I have to say is thank you! !